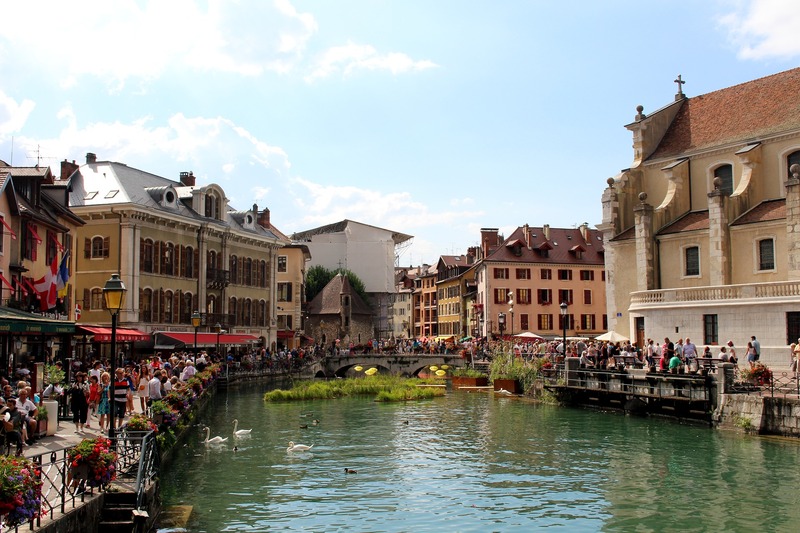 Annecy, nestled near Switzerland and Italy, has been called the pearl of the Alps. See it and you’ll agree. It has also been named the Venice of the Alps, an image that leads us to the river Thiou, as well as canals and bridges that weave through the town’s medieval Vieille Ville, or Old Town. It sits close to the Swiss border, just 25 or so miles north of Geneva. Annecy’s population remains small, around 50,000, since it is hemmed in between the lake and mountains. The surrounding towns continue to grow, with large companies drawing new residents, as well as those seeking peaceful beauty far from hectic city life. A university supplies many young students, and the International Annual Animated Film Festival draws crowds each year in early June. 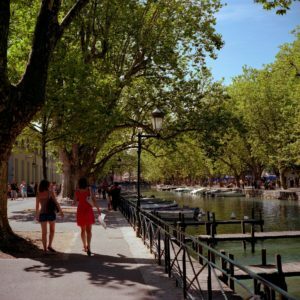 Annecy is an idyllic spot well-known and much sought for breath-taking beauty. 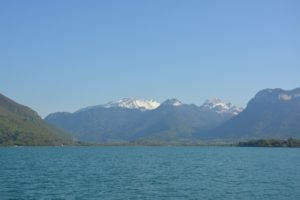 Lac d’Annecy, the lake that steals the show, is reputed to be the purest in all of Europe. Old Annecy draws tourists from everywhere. It is truly old, dating from Roman times. The city strives to protect green and wooded areas and was distinguished as one of the most “flowering” towns of Europe, with bursts of color everywhere you look. If you need visual enticement, take a look at the official Tourist Bureau website for video clips that make you want to go…instantly! www.en.lac-annecy.com/ It’s really gorgeous, trust me. Their local office in Annecy is 1 rue Jean Jaures. Actually there are three offices on different sides of the lake, so if you aren’t near the Old Town you’ll want to check the website first. On the same outdoor theme, the surrounding areas afford many hiking and biking opportunities. Trail recommendations are available through the Tourist Bureau. Jardins de l’Europe : beautifully landscaped gardens from 1863. Pont des Amours (bridge of lovers) is nearby the Jardins. Go there for a kiss and/or a photo! Rent a bike and tour around the city and lake. Palais de l’Ile : Built in the 12th century, this monument was a court house and a prison, but now is a history museum that sits pretty much in the middle of the river. It’s one of the most photographed structures in Annecy. Château de Montrottier, about 6 miles away, is a feudal chateau straight out of the storybooks. Built between the 13th and 15th centuries, you see history in front of you. www.chateaudemontrottier.com/ Another lovely website, but in French. Artwork, suits of armor, and a guided visit (or not), your choice. Chateau d’Annecy: Annecy Castle, where the Counts of Geneva lived. Structures in the castle range from the 13th to the 16th centuries. Today it houses a museum of local art and history. Cathédral Saint-Pierre d’Annecy from the 16th century also contains artwork, this time from the 19th century. The interior is simple and airy, and contains an impressive pipe organ. Eglise Saint Maurice: 15th century gothic architecture, also housing artwork. Basilique de la Visitation (contains the tomb of Francois de Sales, bishop of Geneva in 1601) is a more recent cathedral, 19th century, and affords a view of the city. Nearby cities: Chambéry, Aix-les-Bains, Geneva, and a little further away, Le Mont Blanc (the highest mountain in Europe) and nearby Chamonix, Switzerland and Italy. No need to say…plenty to keep you busy!